Explorer! covers a variety of different explorers from all over the world. The adventures are broken down into polar, ocean, land, desert, sky, and new frontier explorers. The book begins with a timeline of well-known explorers and others less recognized. 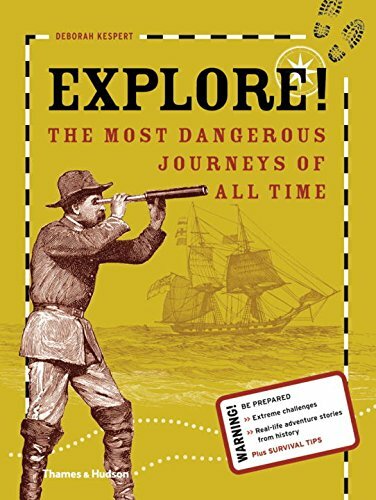 In each section the author adds information such as dangers the explorers faced, background of the trip, the challenges faced, as well as the 5 Ws. It also incorporates more information about the people and the area explored. Some maps have also been included for reference. Many real pictures and diagrams have been added to further the educational aspects. The back of the book also includes some great information about the most extreme places to travel on Earth. Overall this book is a wonderful reference for children who want to know more about the life of an explorer. From lists of supplies they brought with them to all the places they visited throughout their journey, this book covers it all. Children will learn a lot of fascinating information that would be useful for any research project as well as offering an interesting read in general. Children ages 8–12 will enjoy reading this 96-page book about some of the most dangerous journeys of all time. With great photos, drawings, and maps this book will make readers feel like they are going along on the journey—minus the disease and frostbite.